It’s easy to fall into a boring routine when it comes to packing lunches for school. The standard sandwich, apple, carrot sticks, and juice isn’t always the most interesting — or healthy — lunch to bring every day. Using a bento lunch box can help get your culinary creativity flowing. Bento lunch boxes are divided into compartments, making it easy to store a variety of foods in the same container. Using one box to store a complete meal means more efficient storage and cleaning, too. Many bento lunch boxes are made of metal, which does not contain the same harmful contaminants as plastic. Here are 10 lunches that fit perfectly inside a bento lunch box for taking to school or work. 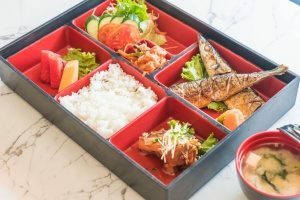 Bento boxes come from Japan, so a Japanese-inspired lunch is a perfect treat. Teriyaki chicken meatballs provide filling protein and can be paired with a scoop of white rice and asparagus spears to finish off a healthy lunch. The meatballs can be made over the weekend and frozen in their sauce for easy storage, then defrosted overnight to make your morning routine a little easier. The recipe makes a hearty quantity, so it can pull double duty and become lunch for both you and your children all week long. This lunch can make a satisfying breakfast for particularly early days or even a filling snack before sports practice in addition to a great lunch. It’s also a breeze to prepare during rushed mornings. Just cover a whole-wheat tortilla with the nut butter of your choice, place a whole banana on top, and roll it up. You can also add some jam for a twist on the classic PB&J. Fill the rest of the bento lunch box with fruit and veggies, like kiwi, carrots, grapes, and blueberries. Who doesn’t still love to get a Lunchables tray to take to school? Instead of spending extra money on the real deal, make a cheaper and healthier version yourself at home. For a classic Lunchable copycat, fill your bento lunch box with crackers, cheese, and ham or turkey slices, then add in some fresh fruits or veggies for a meal that’s better than the real thing. It’s not a Lunchable without a sweet treat, so top it all off with a cookie or small chocolate bar. Are you more of a Starbucks person? It’s just as easy to recreate the coffee shop’s famous protein lunch box in your bento. The original box contains cheese slices, a hard boiled egg, grapes, apple slices, multigrain bread, and peanut butter. Swap the bread out for crackers, which are easier to keep fresh throughout the week, and the peanut butter for a different kind of spread if you’d like. Then add in whatever other fresh fruits or vegetables you might be craving that day. Cucumbers are a great choice, since they’ll stay cool and crunchy all day long. For gluten-free kids, this portobello pizza ensures that they don’t miss out on all the fun. 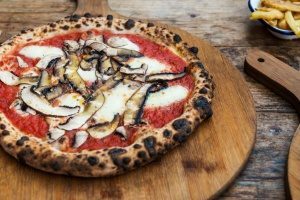 Top a large portobello mushroom cap with tomato sauce, mozzarella cheese, and toppings like sliced pepperoni or bell peppers. Some more fresh veggies, like corn, carrots, and even broccoli, can be paired alongside cherries and peaches for a picnic-worthy spring lunch. If your kids aren’t fans of mushrooms, you can also make mini pizzas using round slices of milder-tasting zucchini instead. This meal is also an excellent idea for parents who’d like something a little more low-carb for their own workday lunches. If you’re having trouble getting the kids to eat their vegetables, this colorful array might convince them. Use a bento lunch box with multiple small compartments to individually store a selection of salad components, like cucumbers, cherry tomatoes, sunflower seeds, cranberries, edamame, carrots, and a handful of lettuce, then add in a container of dressing or some lemon wedges for a healthier dressing. Not only does this arrangement make a boring salad look even more impressive, it ensures that everything stays nice and crisp before lunchtime. Burrito bowls can be a great way to use up leftovers in a creative way that won’t bore picky eaters. You can use black beans, pulled pork, tomatoes, corn, lettuce, cheese, or whatever other components you might have from last night and pack them each in a separate section of the bento box. Add a couple of tortillas, and your child will certainly look forward to mixing up their own custom burritos during lunchtime. Here’s another interactive lunch that’s perfect for vegetarian or gluten-free families. Create a fun fondue-style box with a selection of classic veggie tray options like carrots, broccoli, celery, and cherry tomatoes, and pair them with a small container of ranch dressing for dipping. Balance the savory with the sweet and add some fruits, like sliced bananas, apples, and strawberries to the other half of the box alongside a container of yogurt for dipping. You can add nut or seed butter, honey, and cinnamon to the yogurt for an extra special dip. Pasta is a filling choice for older kids or children who have active extra curricular activities, like dance or sports. Mix orzo pasta with veggies like broccoli and chopped cherry tomatoes and a dash of olive oil and salt for dressing. In the other compartments of the bento, you can provide a selection of fruit, cheese cubes, nuts, and a little something sweet to round out the meal. Instead of a sandwich, try a handful of apple and zucchini muffins for a new twist on lunch. These muffins are made with Greek yogurt, making them a little better for you and your kids than a traditional muffin. These can be paired with whatever fruits and veggies you have on hand for side dishes. The muffins can also be made in a large batch ahead of time, making them an easy lunch to pack using bento lunch boxes during hectic mornings.